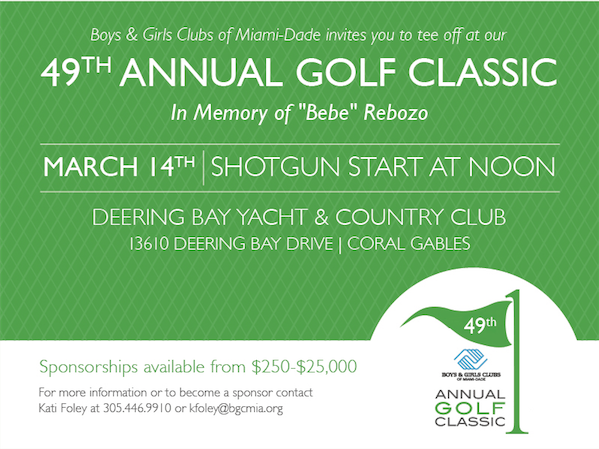 Boys & Girls Clubs of Miami-Dade is hosting its 49th Annual Golf Classic in Memory of “Bebe” Rebozo on Monday, March 14, 2016. The tournament is taking place at the Deering Bay Yacht & Country Club, located at 13610 Deering Bay Dr., Coral Gables, FL 33158. The event offers players the choice to simply play for fun or at a competitive level. Event participants will have the opportunity to engage in a memorable golf experience in addition to raising funds for the Clubs’ youth development programs, which are based on fostering skills in computer, education, cultural arts homework, educational assistance, and social life competencies, as well as sports and recreation. The event is expected to raise more than $100,000 for the Club’s programs. For more information about sponsorship or underwriting opportunities, or to reserve a foursome, individual golfer or purchase dinner only tickets, please contact Kati Foley (305) 446-9910 ext. 30, or via email at kfoley@bgcmia.org. To find out more information about sponsorships, click here.